On our way to our accommodation from the airport, our cab drove through Susukino to reveal a row of illuminated ice sculpture. That was our prelude to the Yuki Matsui, internationally known as Sapporo’s Snow Festival. For seven days every February, Japan’s largest winter event is turned into a winter wonderland of snow stations and ice sculptures. From a few snow statues created by high school students on its main site, Odori Park in 1950, the festival is now an event visited by millions. Packed with people walking the slippery path that spans the 1.5km Odori Park showcasing spectacular snow and ice sculptures of different size and shapes from local and international participants. We came across humongous structures such as the Arc de Triumph sculpture and the Taipei Guest House. Some serve as a stage for concerts and other performances. Star War characters R2D2, C3PO and Darth Vader and other cartoon characters make up the fun stuff. Meanwhile, I am drawn to the smell and the sizzle of beef being grilled on an open barbecue pit, even if we just came from lunch. 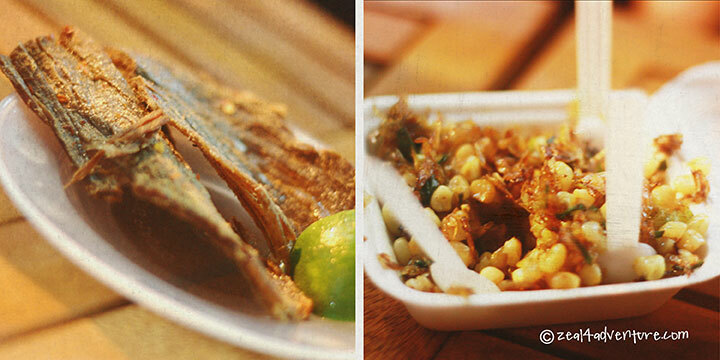 Not to be left out are the food stalls of various kinds. A piece of advice to future attendees, skip lunch that day and head straight to the park. The row of illuminated ice sculptures that I saw the night before is less dramatic in daylight. Packed with bars, restaurants, pachinko and red light establishments, Susukino really comes alive upon sundown and so does its displays found on its main street. We weaved through the sculptures into Ramen Alley for lunch. 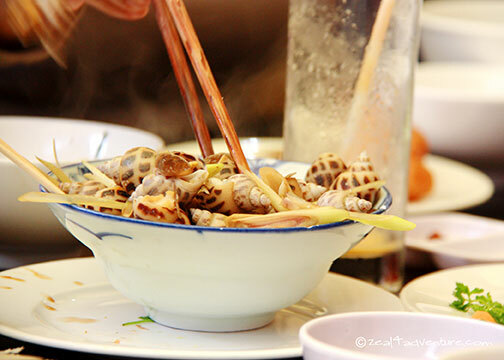 The alley has 17 old style ramen shops to choose from. In a shop randomly selected to fit all 7 of us, we slurped down a bowl of noodles in miso broth topped with seaweed, spring onions, char sou pork, hard-boiled egg, corn and a slice of butter—unique ingredients that make Sapporo’s Ramen worth a try. 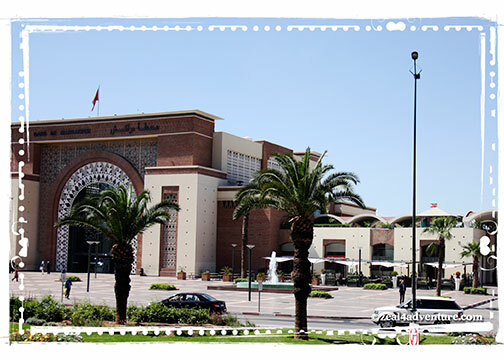 The third venue is a multipurpose dome where a variety of events take place inside. Outside the dome is where the fun is. Large snow slides and a snow rafting area is set up for the merriment of people of all ages. Sadly, as the venue is a little away from the city center and is only open until 6 pm. 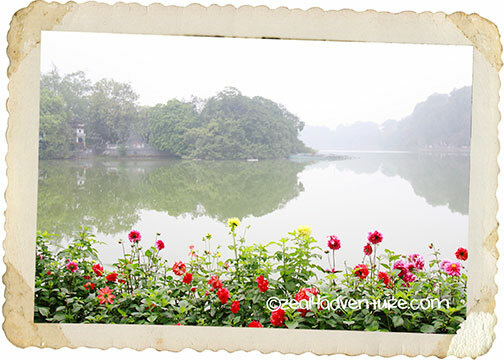 One reason I love Hanoi is this stunning lake. 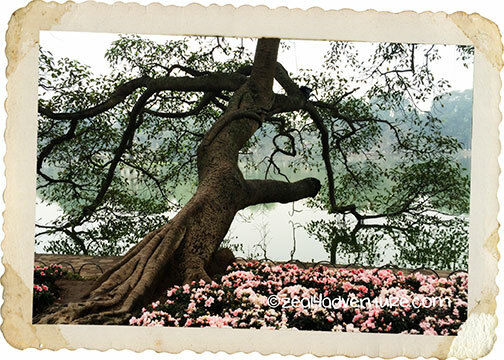 Serene, spellbinding, and picture-perfect – makes for a pleasant walk, and you will definitely walk by it more than once a day. And because the Old Quarter surrounds it, it is a good reference point when navigating the city. 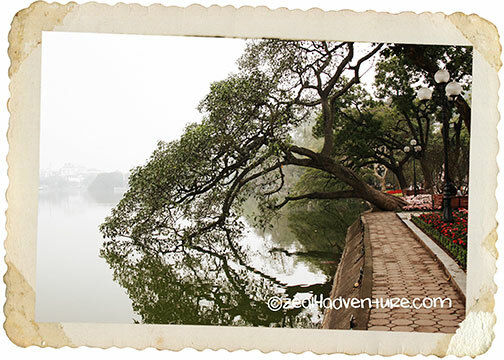 Hoan Kiem Lake is the heart of Hanoi. 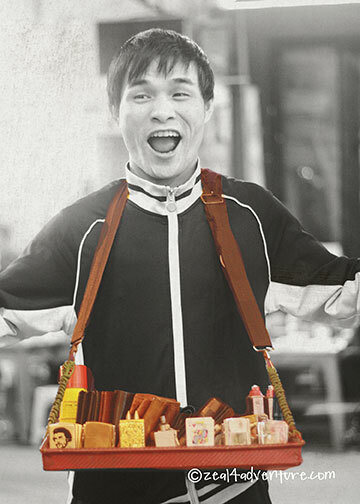 Everything happens around it, from early morning workouts (think yoga, tai chi and even aerobics) to old men whiling away time playing mahjong and vendors selling their stuff. Not to mention the wandering tourists that flock to this mesmerizing lake. Never a dull moment in this part of the city, that’s for sure. 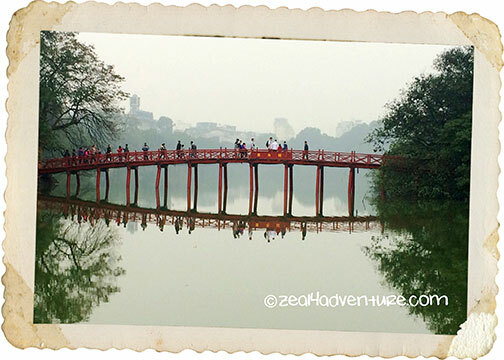 What makes the lake so smashing is the striking red bridge called The Huc Bridge leaping out of the serene blue-green water. It connects the shore to the Jade Island on the northern coast of the lake. 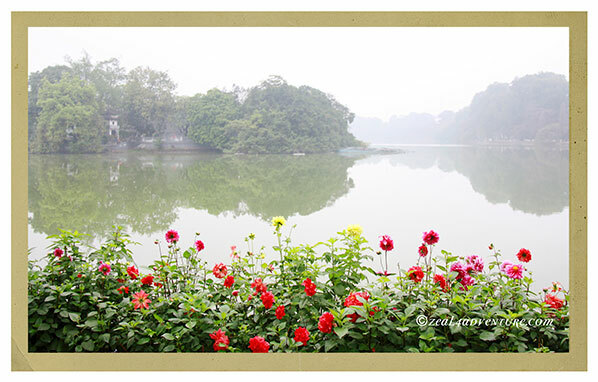 On the island stands the Ngoc Son Temple (the Temple of the Jade Mountain). Legend has it that in the mid 15th century, Heaven sent Emperor Le Loi a magical sword, which he used to battle against the neighboring countries, driving away the Chinese from Vietnam. 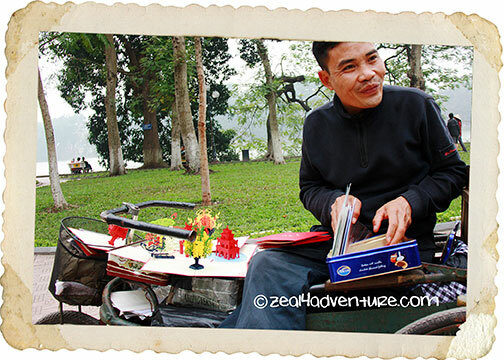 When peace prevailed, a giant golden turtle grabbed the sword and disappeared in the depths of the lake (named Thuy Qua then) inspiring the name Hoan Kiem , which means Lake of the Restored Sword. 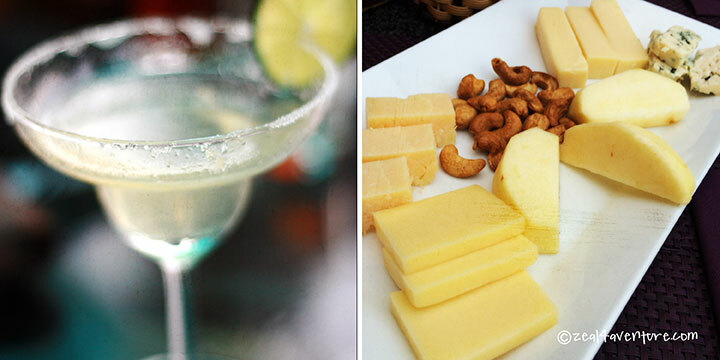 We’re not big on night outs but the mere mention of a “beer corner” got our attention. We learned about it by chance at the hotel lobby and, of course, we had to go. 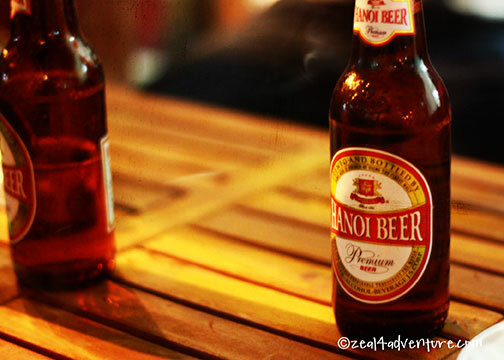 Hanoi’s Beer Corner is a strip of a makeshift outdoor bar that spills over from Luong Noc Quyen to Ta Hien Street. 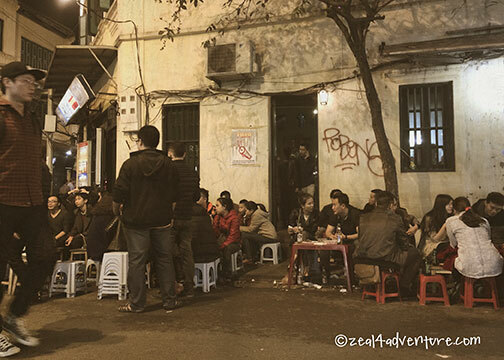 It is packed with people (locals and foreigners) sitting on small stools gathered around a little table on the street enjoying their beers. 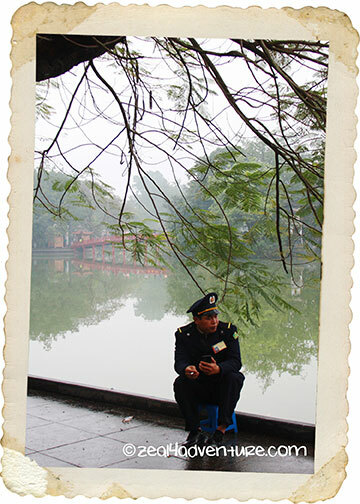 Many also people watch by sitting on stools facing the street. So there we were in our little corner, sitting (almost squatting) on small wooden chairs, enjoying our beer with food that keeps coming. 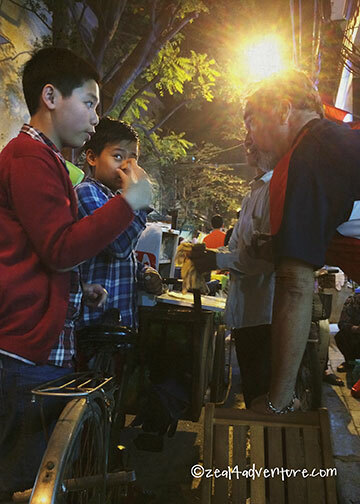 International School student (out for a birthday party with friends) explains and recommends to Anton a street food. 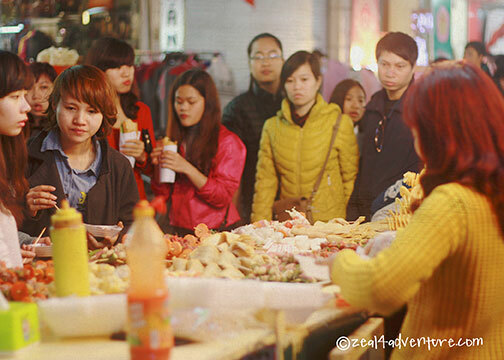 We chatted with locals who introduced us to a string of sumptuous street food from the various vendors that scatter the area offering local favorites. 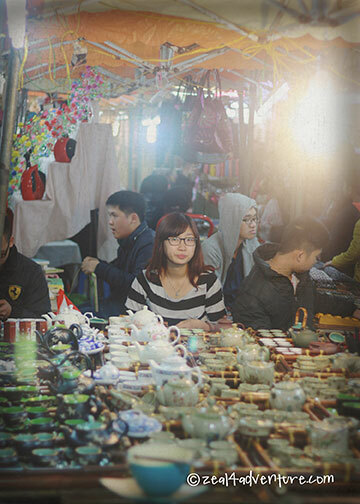 If you find yourself there on a weekend, before heading out to the Beer Corner, the weekend night market might interest you. 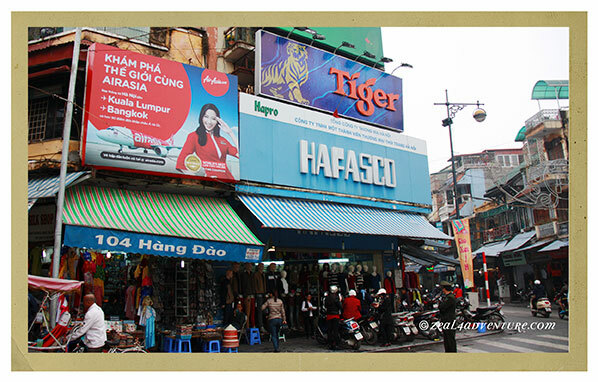 The Dong Xuan Night Market spreads along Hang Giay to Hang Dao Streets, splitting through the center of the Old Quarter. 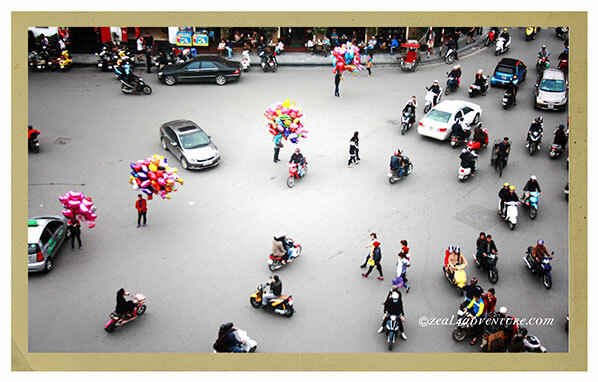 The streets transform into vehicle-free pedestrian lanes (but some motorbikes are seen navigating the streets still) as stalls are set up in the middle of the road. 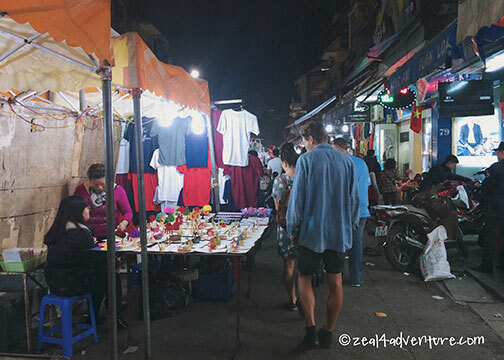 I find nothing spectacular with this market, truth to tell – you’ll find a myriad of stalls selling merchandise from clothes to souvenirs to food of all kinds. Having said that, it is still interesting to at least pass through, you never know what you might find – we did get a few of these. 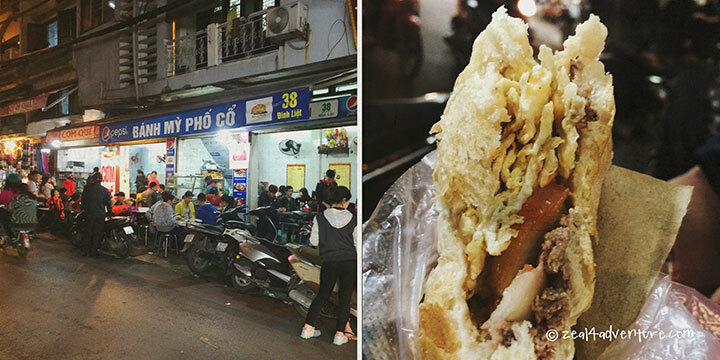 Banh Mi: A Vietnamese sandwich of a combination of pork, eggs, pâté on a baguette. Usually found on small shops or stalls by the road. but what we should have done instead was to go there for the food. 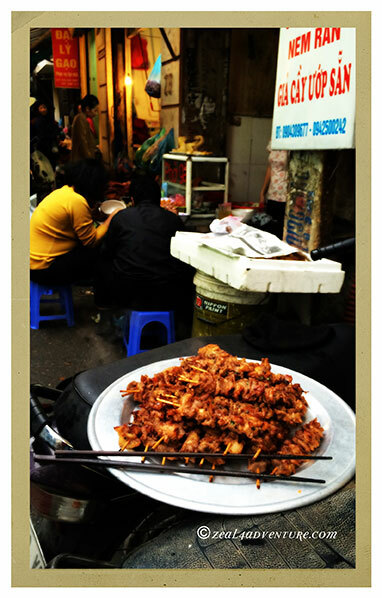 It is a fabulous place to explore some street food. 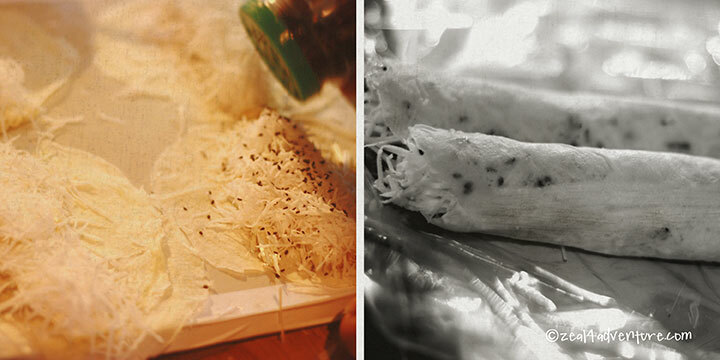 Shredded coconut flavoured with sugar and sesame seed, rolled in some sort of crêpe or a spring roll wrapper. Can make for a lovely dessert. 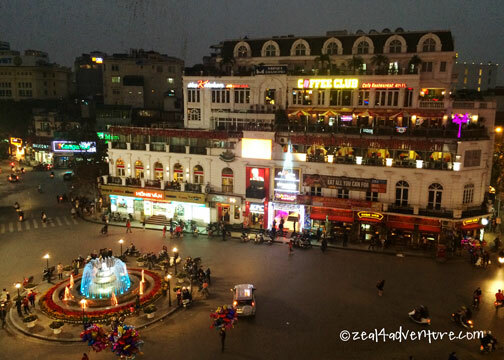 Our favorite spot to while away the time before dinner is at any of the terrace cafes atop a building overlooking Hoan Kiem Lake and the plaza below. 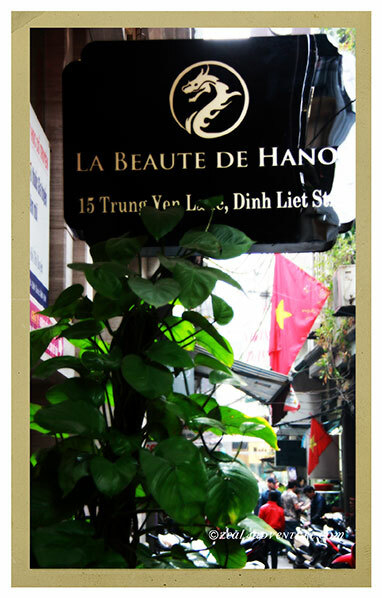 We like it because it is the best place to enjoy a few drinks while we amuse ourselves with the crazy traffic of Hanoi. 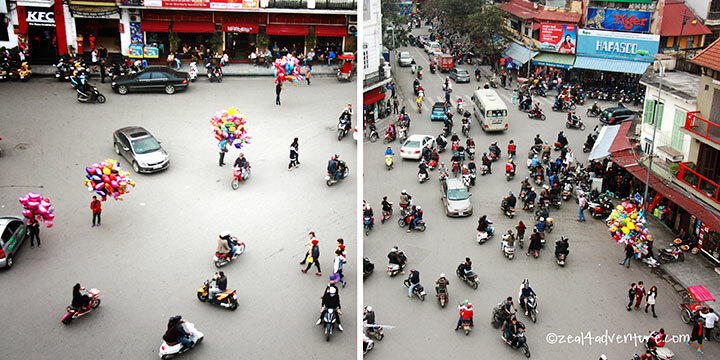 Pedestrians, cars, vendors and motorbikes — all going their own way. From my last visit 7 years ago, nothing much has changed (including the traffic) except for a few more cafes to choose from. We were at the City View Cafe every night 7 years ago, but we made sure to check out the Coffee Club (under construction then) across so we could enjoy the view from a different perspective. 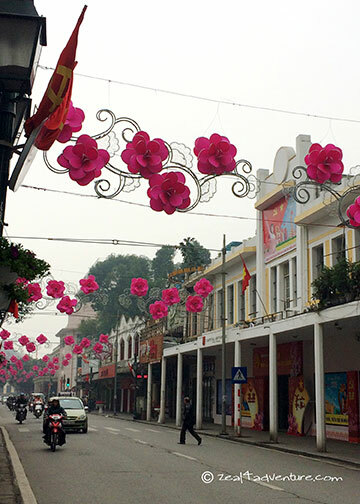 Ba Dinh District also called the French quarter is a pleasant interlude from the chaos of the Old Quarter (especially if you are staying in the Old Quarter like we were). posh hotels, fancy restaurants and swanky shops. 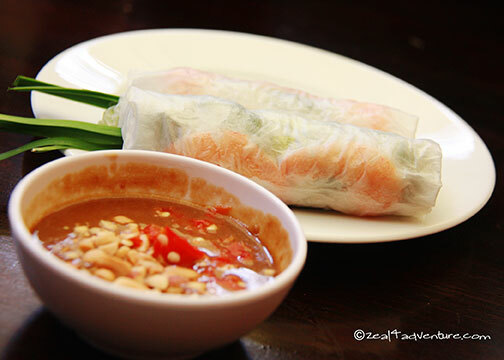 On our way to lunch, we walked through Trang Tien, the main artery of the French Quarter, walking pass (but never entered) the famous ice cream store, Kem Trang Tien. 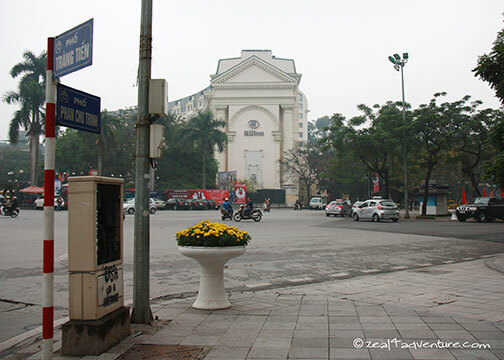 Elegant French style buildings and villas replaced the old Vietnamese buildings in this section (as the name suggests) when the French occupied Hanoi in the last 19th century. 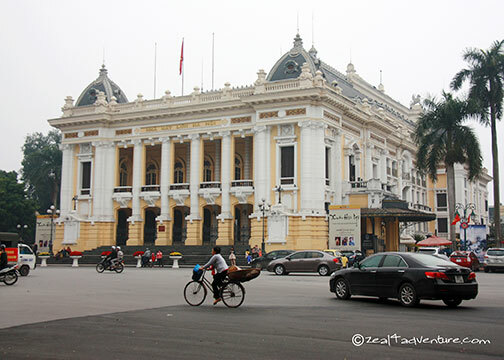 At the end of Trang Tien, on the August Revolutionary Square, the Hanoi Opera House, stand proudly as an architectural, political and cultural symbol of the capital. 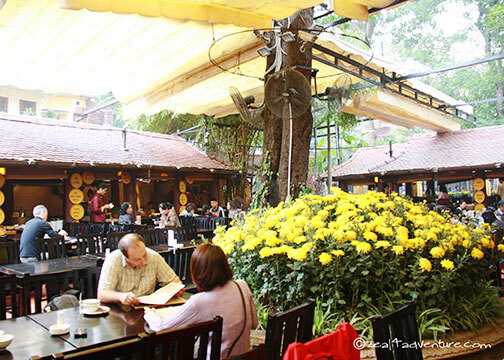 Lunch at Au Lac House along Tran Hung Dao was a pleasant default. We were headed to La Badiane (which we never got to try but came highly recommended) but were unfortunately closed for the day. The reason is a blur to me now but because we were there during the Lunar New Year, it could be because of that, but I digress. So, just a few steps away from La Badiane is Au Lac House, a large French Style garden house built during the French colonial period restored into an elegant dining venue. 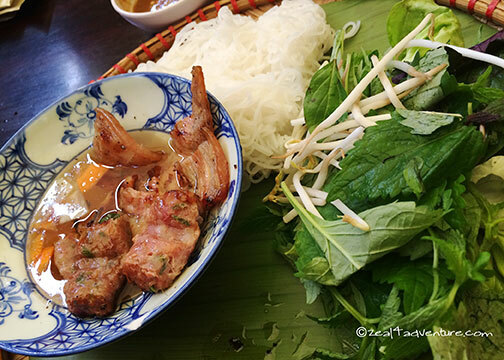 The food was Vietnamese Specialty (a sudden mind-shift from the expected French lunch at La Badiane) and quite impressive too. 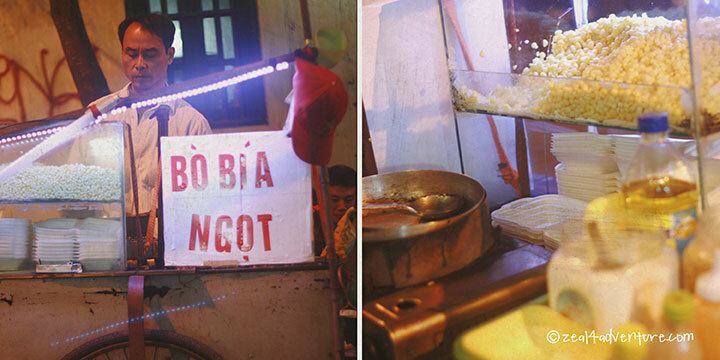 Truth to tell, Vietnam is always a gastronomical delight whether it be hole in a wall or high-end. You can walk through the different stations with your server and point and choose and the food will be prepared and served accordingly. The beautiful house and stunning interior with old photographs were icing on our cake. 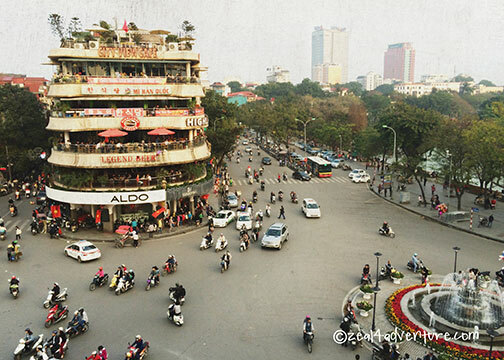 The capital of Vietnam and perhaps one of Asia’s most nostalgic. 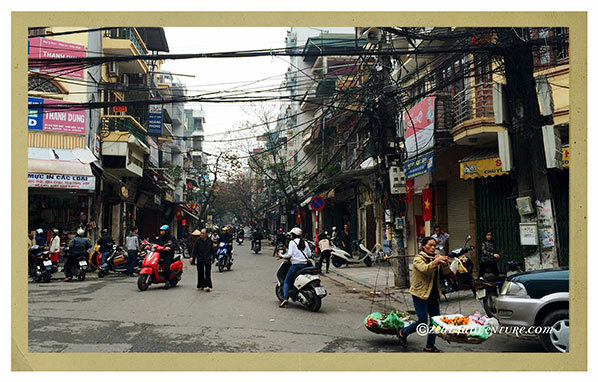 A sleepy town, Hanoi is not. 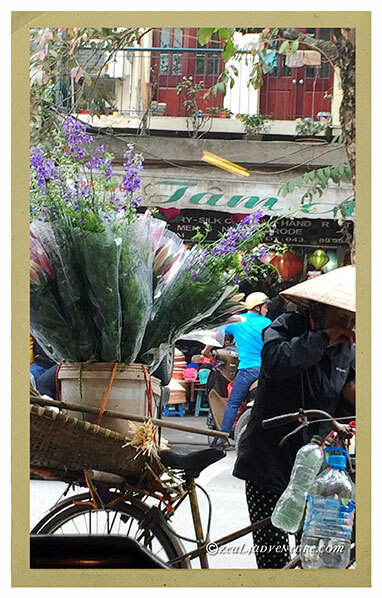 On our arrival at midnight, the street was still or maybe already bustling with flower vendors unloading flowers for transport. 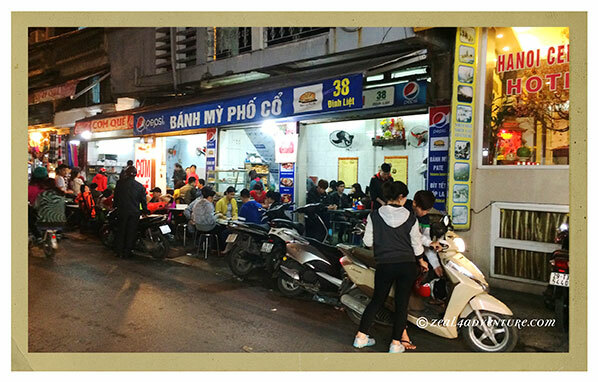 The alley near our hotel, though seemingly winding down, scatters with people. And, of course, during the day, it is chaos. 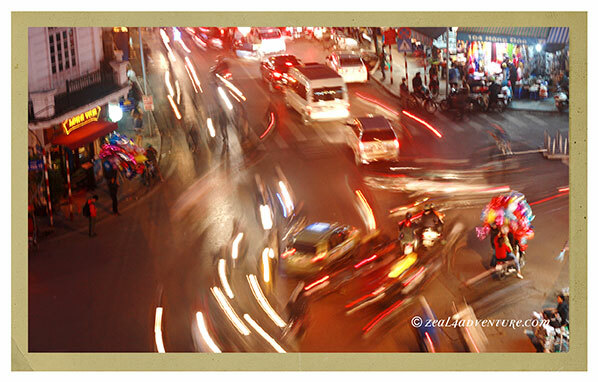 Motorbikes, bicycles, cars, peddlers, and pedestrians whiz by in different directions, honking, and pushing. We like watching this organized chaos from the balcony of a coffee shop . Somewhat similar (but not as crazy) to how we Filipinos cross our streets and highways, actually. 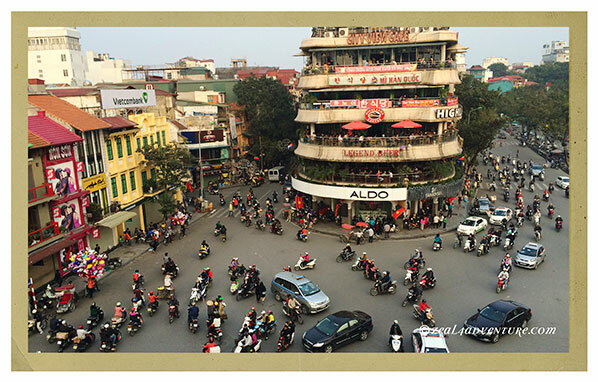 Hanoi is noisy, busy and clogged with motorbikes as it is serene, cultured and delightful. 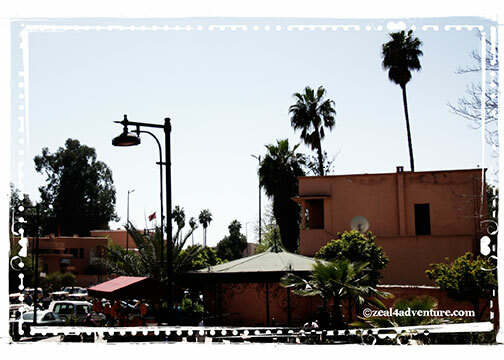 The tranquil lakes, excellent food scene, beautiful architecture, the old quarter and colonial architecture offset the madness. 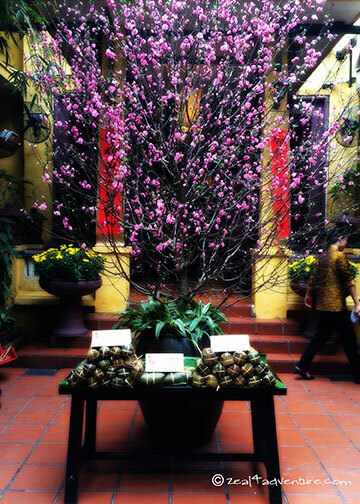 This wasn’t my first time to Hanoi but coming back was something I knew would happen again and again. Seven years and I notice some changes, more charming boutique hotels for one and the night scene has gotten more packed. But many has remained the same. 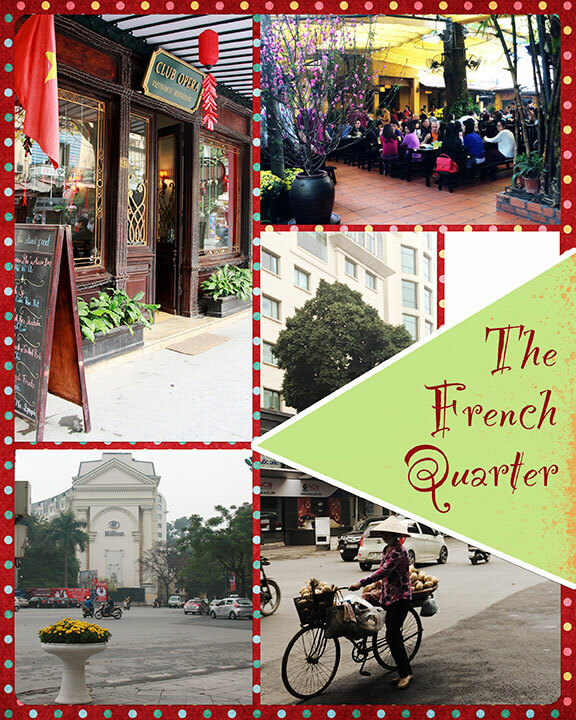 We stayed in the Old Quarter, a nice boutique hotel in an alley too narrow for cars. 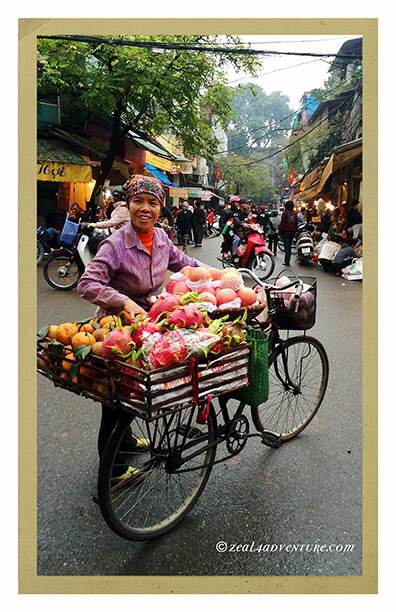 This district is the soul of Hanoi where travelers go to immerse in its historical labyrinth of 36 streets, each named after the trade it specializes in. 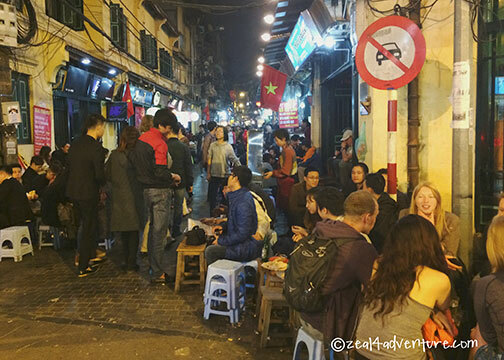 Similar to Morocco’s markets, streets in the Old Quarter are named Silk Street, Herbal Medicine Street, Appliance Street, Blacksmith Street, etc… you get the drift. Why? 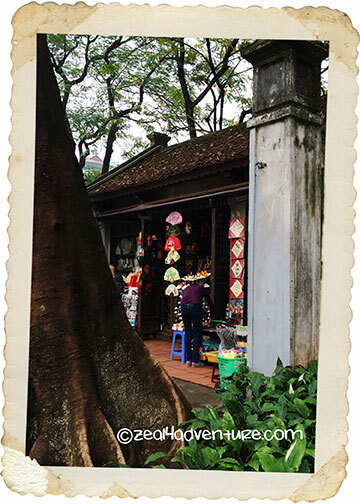 The Old Quarter became a crafts area when King Ly Thai built his palace there after Vietnam’s independence. 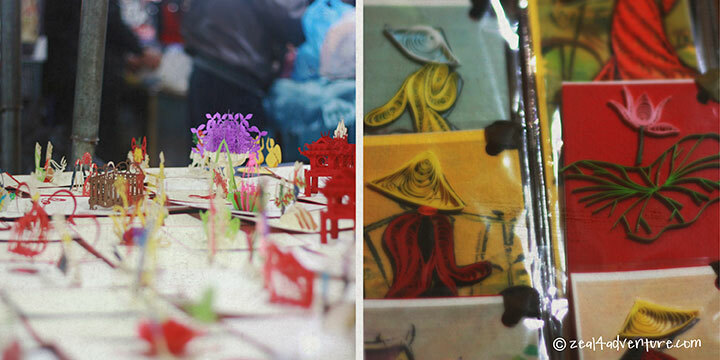 Not long after, craftsmen clustered around the palace according to their skills. These artists who worked and lived close together formed their respective cooperatives and the streets consequently earned its names, according to skills. These rows exist to this day and still buzz with commerce. 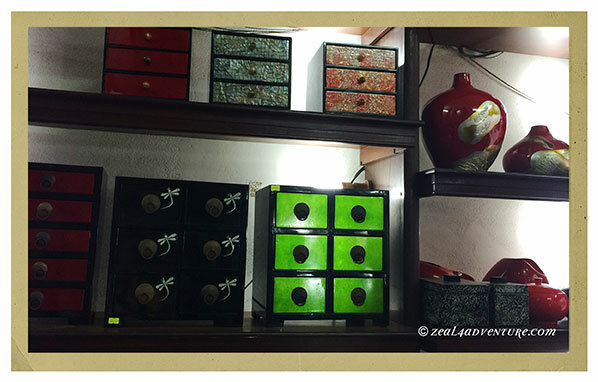 You can find about anything from the traditional down to the knock-offs. 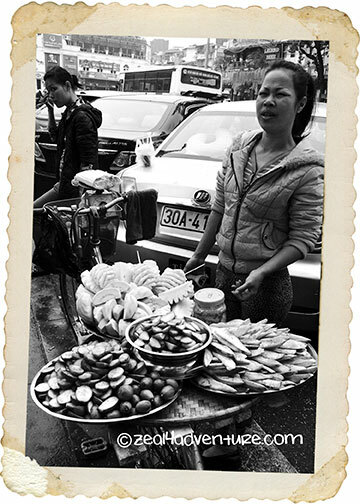 The people of Hanoi do a lot of their living and working outside of their small tube houses or stores. And they make use of the sidewalk, which, of course, is also where they park their motorcycles and bicycles. People tend to walk along moving vehicles… on the street. 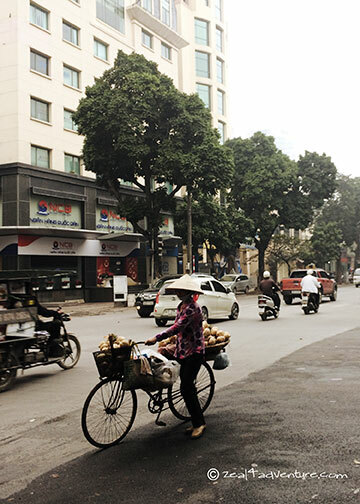 With its idiosyncrasies and all, Hanoi is easy to love. Stay with me and you’ll see why. 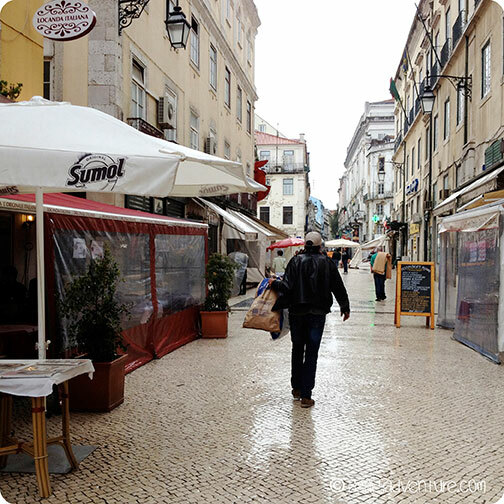 I walked around the part of Baixa closest to our hostel, bewitched. Lisbon, you are a surprise. 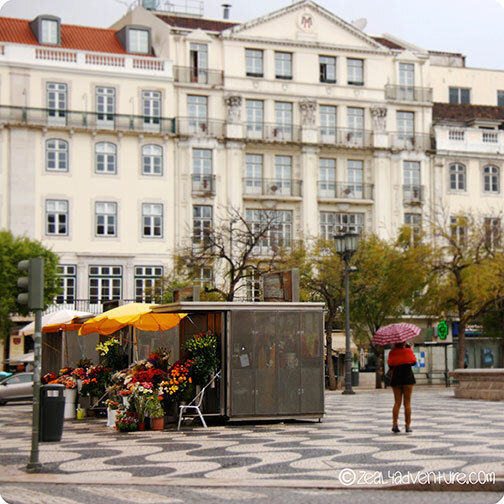 Elegant squares, streets filled with cafes and shops, old tramcars, street performers, Neo-classic and Art deco buildings, street vendors selling everything… All this adds to the charm of downtown Lisbon. 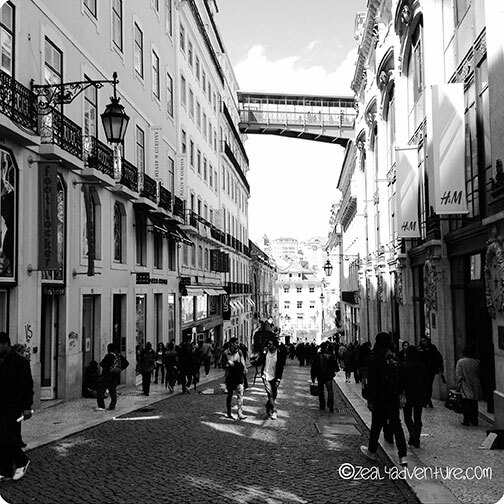 Baixa borders the river in the bottom of the valley and nestled among the hills of Alfama, Chiado, and Bairro Alto. It’s grid like area stands in contrast to the winding and complicated alleyways of neighboring Alfama. 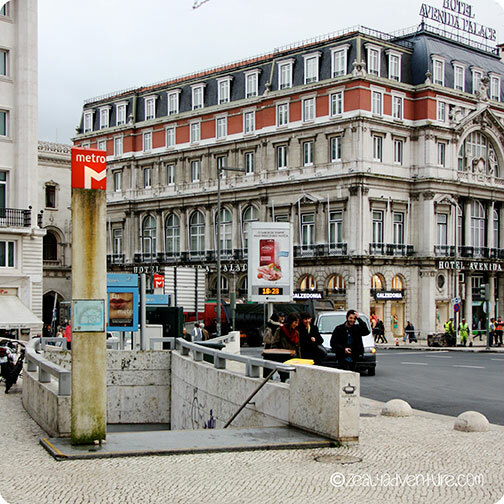 A central location extending to the Tagus River and Avenida da Liberdade (the Liberty Avenue) and is considered the most elegant of all districts in Lisbon. Rossio. Where the main central square is found. 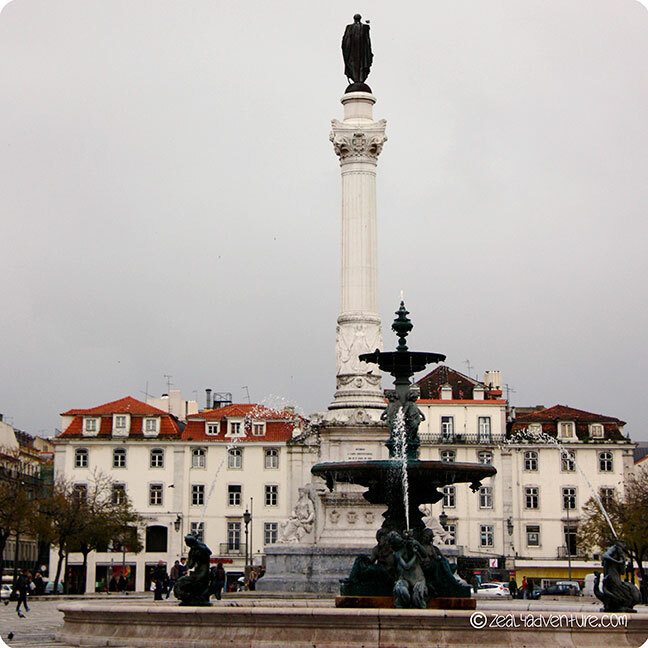 Officially named Praca Don Pedro IV, the square is also called Rossio Square because it revolves around Rossio. It is the heart of the city and surrounding it is nothing but a bundle of architectural delights and here’s sharing with you a bit of Baixa. 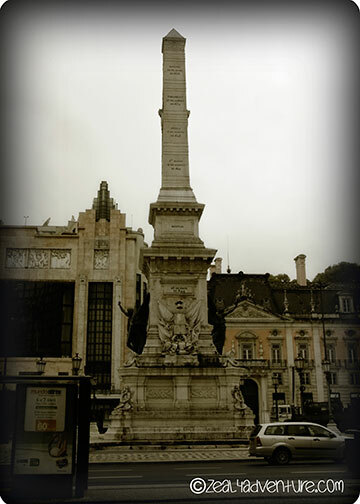 Neighboring the imposing Rossio Square is one of the city’s important transport hub. The metro, the buses, and the charming trams stop here and many shops, cafes, and guesthouses surround the square because of it. 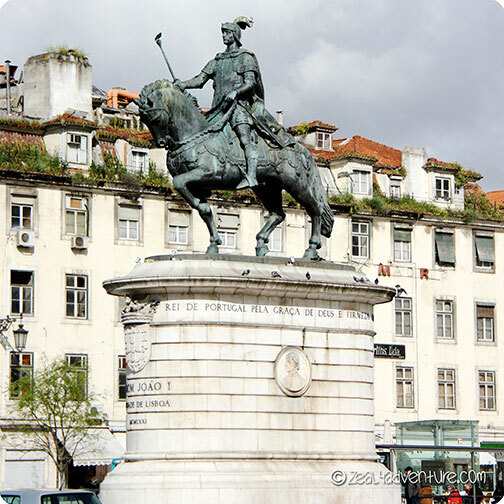 The bronze equestrian statue of King João I stand on a pedestal in the middle of the plaza, the beautifully designed grounds covered with pigeons. This beautiful neo-classical building survived the earthquake but was destroyed by fire in 1964. It was rebuilt in the 70’s and with it founded Lisbon’s municipal orchestra. 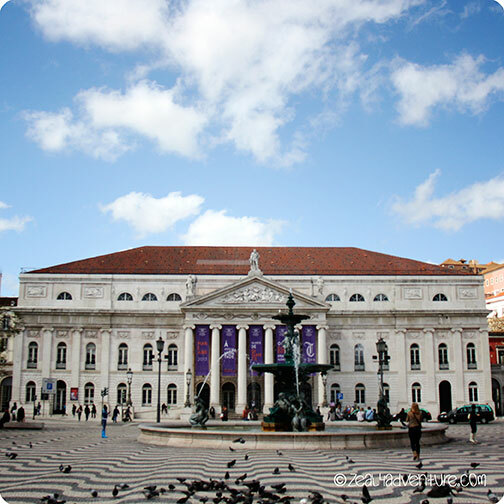 Named after Dom Pedro IV, the theater’s façade dominate the northern side of Rossio Square and now hosts some of the most spectacular performances of Lisbon. Just behind the National Theater Doña Maria II and a stone’s throw away from Pensao Residencial Portuense (our hostel) is a lively pedestrian street buzzing with outdoor cafes and restaurants. 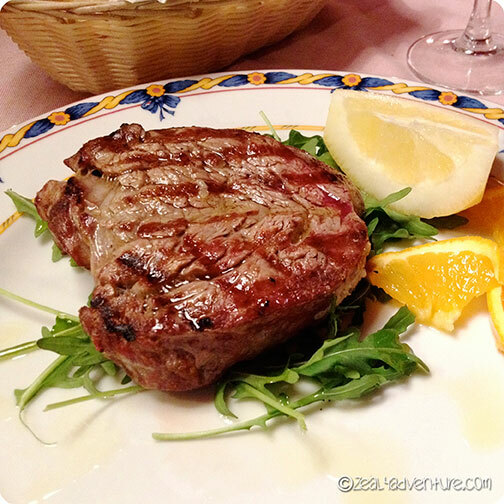 It is a mecca for seafood lovers but ironically, we found Locanda Italiana where we were served a superb steak dinner. This beautifully crafted lift southeast of Rossio Square is the area’s highlight. Raoul Meisner du Ponsard, an engineer, born in Porto to French parents and a Gustave Eiffel student, built this alternative transport to climb up the many steep hills of the city. 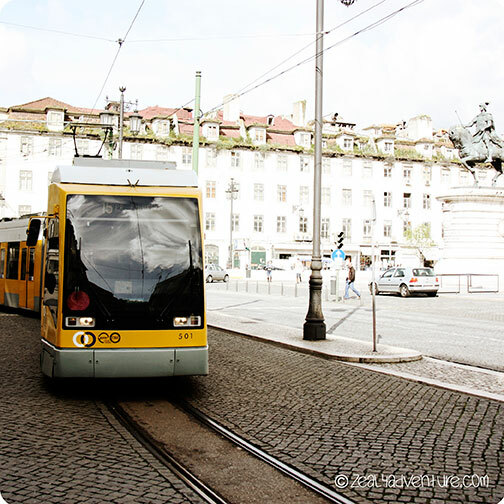 A challenge to Lisbon citizens for centuries. 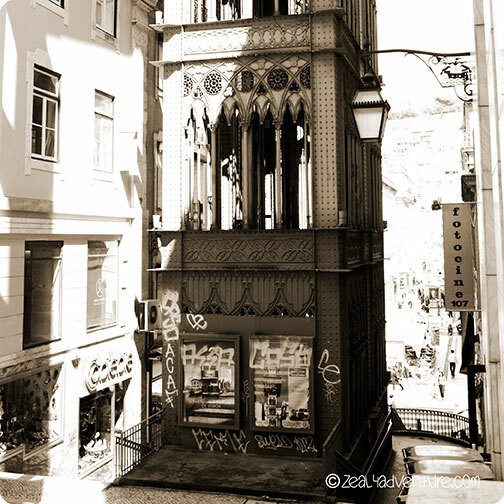 And until the underground Baixa-Chiado metro station opened in 1998, the Santa Justa Elevator was the easiest way to get to the Bairro Alto and Chiado district from Baixa. One of the most beautiful train stations I’ve ever seen. Looking more like a temple, the façade is decked with horseshoe doorways and the roof is topped with small turrets and a clock tower. 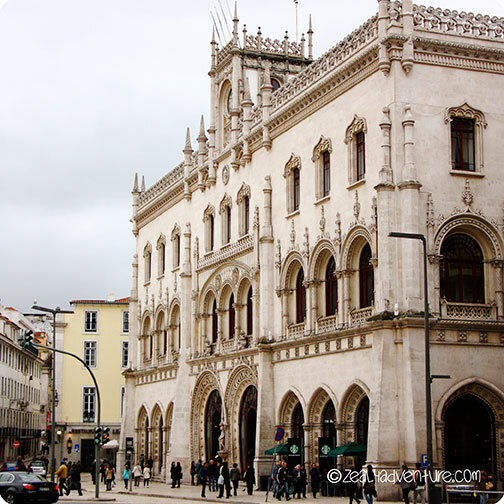 Influenced by the 16th century Portuguese Manueline style, the façade dominates the northeast side of the Rossio Square. Here, the trains depart for Sintra. Surrounded by beautiful 19th and early 20th century buildings, an obelisk standing in the middle of the rectangular square. It has names and dates of battles fought during the Portuguese Restoration War and this entire square is dedicated to the country’s liberation from Spanish rule. 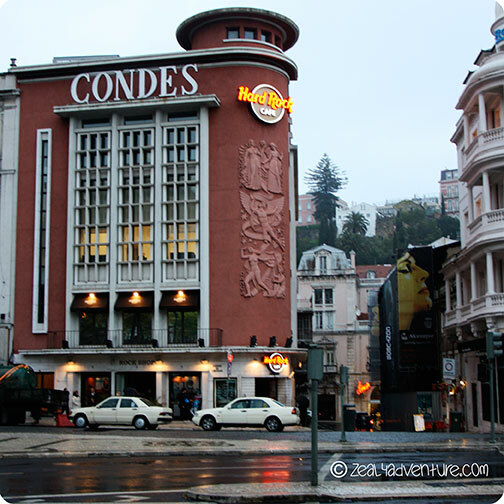 Nearby is the former Condes Cinema, a Modernist building built in the 1950s that reopened in 2003 as Hard Rock Café. 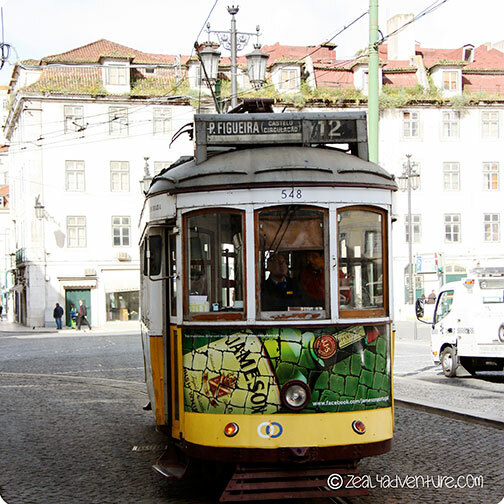 The square is also a few steps away from the Elevador da Gloria, a funicular linking downtown with the Bairro Alto district. 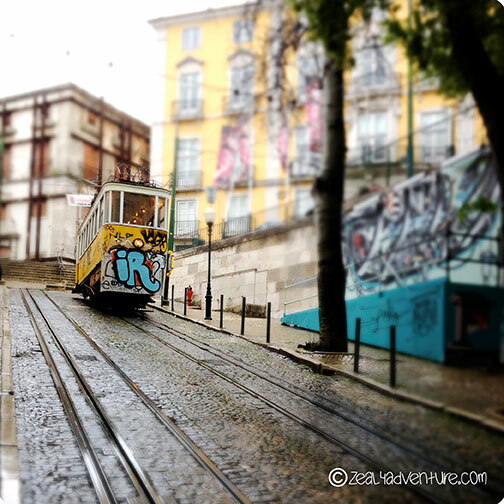 And this is just downtown Lisbon. I don’t normally do this. I like exploring a place on my own, by foot as much as possible. But somehow in the flurry of things, I agreed to hop on this bus (price of which is outrageous by my standard – but what the heck!) and surveyed the city. 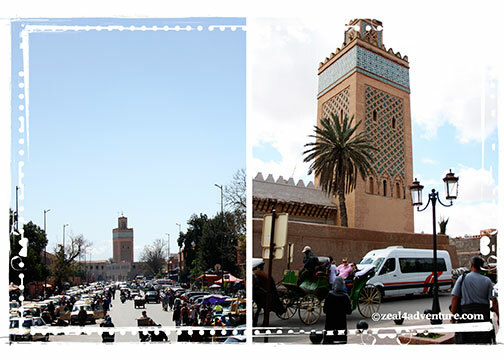 We got on near the Koutoubia Mosque, made a quick drive through around the entire city and got off where we got on. 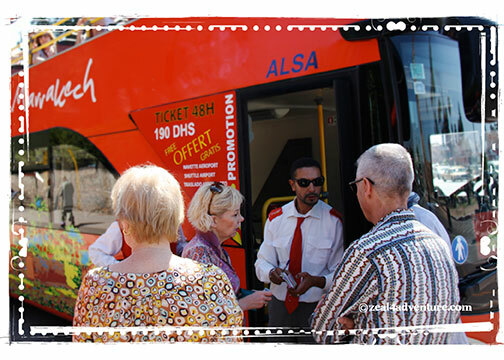 A glimpse of where the hop on hop off bus took us. Av. Abd. 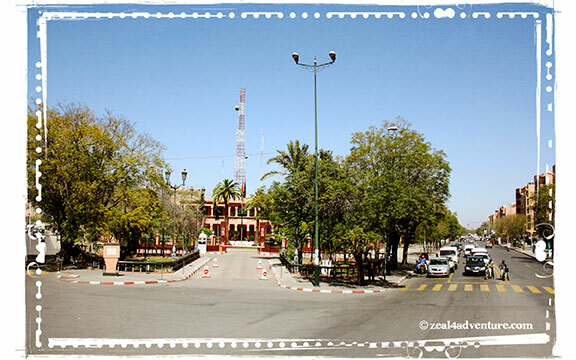 Khattabi — This major route connects Casablanca and the road to Agadir. 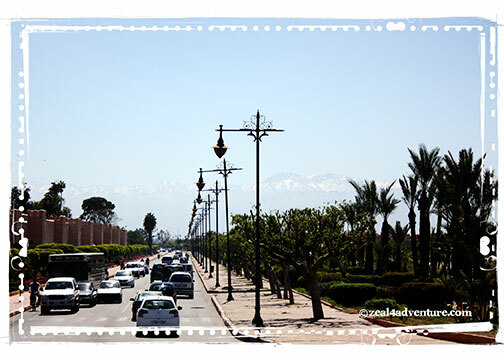 Avenue Prince with the Atlas Mountains as backdrop. 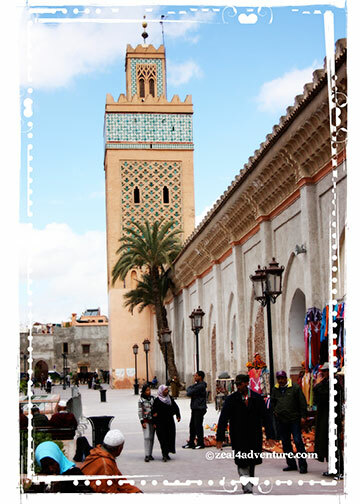 With that overview, we thought that the southern part of the medina was a good area to spend the rest of the day. 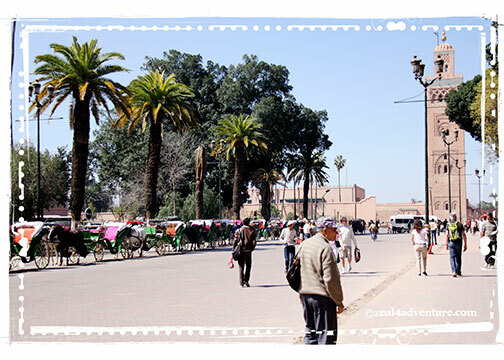 Approaching the Kasbah, a few steps away from the medina, one immediately sees the Kasbah Mosque, probably the 2nd best-known mosque in Marrakech (Koutoubia being the most famous). 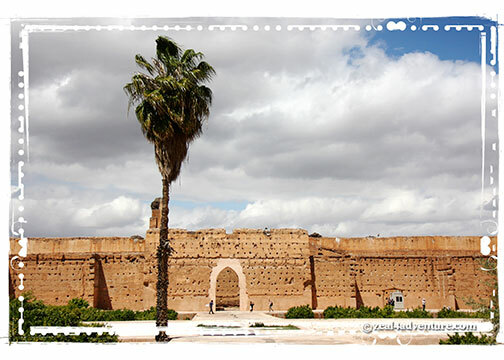 Built in 1190, the 12th century, historic mosque (known locally as Moulay Yasid Mosque) still features some of the Almohad architecture. As with most mosques, non-Muslims are off-limits. 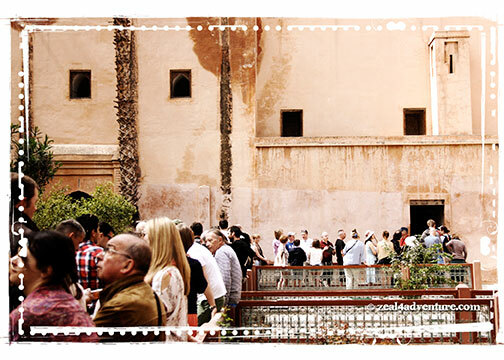 Attached to the mosque are the Saadian Tombs, one of the most prominent sites in Marrakech. 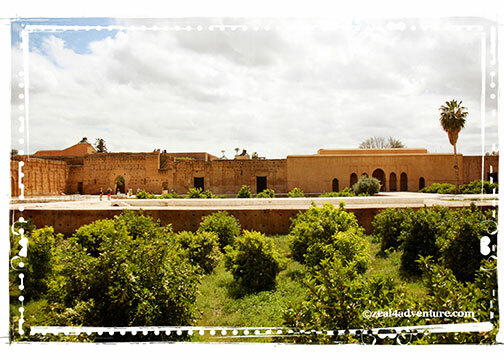 Set in a small ancient walled garden, the 16th century dynastic tombs of the Saadians are among the finest example of Islāmic art. Dotted around the shrubbery are the early mosaic graves of lost identities. 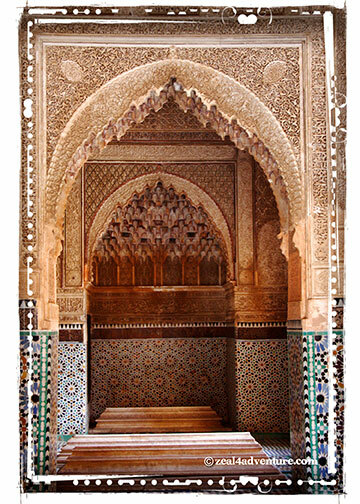 These tombs were discovered preserved, unchanged since the glory days of the Saadian rulers. When discovered in the early 20th century, the entrance was blocked, which may be the reason it remained untouched for hundreds of years. 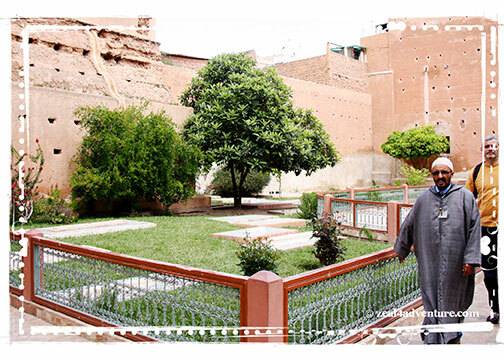 A short walk through the Kasbah’s streets will bring you to the Badi Palace. 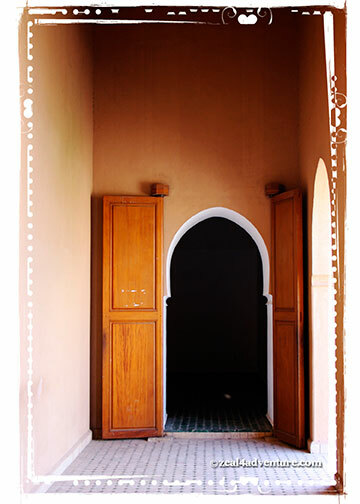 A sultan’s palace, the elaborate 350 rooms, 16th century residence had ornately decorated rooms in its day. Walls and ceilings were encrusted with gold while the inner court had an enormous pool in the center and flanked by 4 sunken gardens. 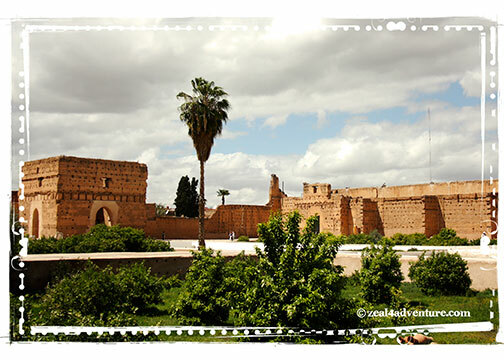 Today it is a denuded ruin when thieves emptied the rooms of valuables after Meknes became the capital in the late 1600s. 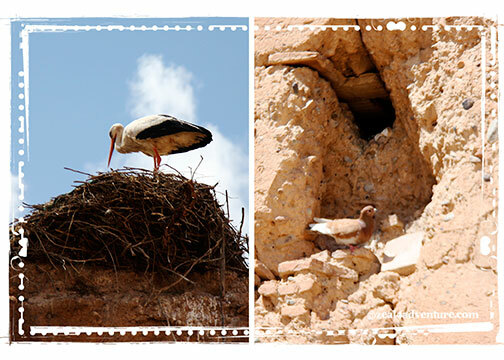 And storks and pigeons had found a home to build their nests in its walls. Still, these are rubbles worth exploring.